AUD 1,400 Excl. Duties / Taxes. This Marquise diamond is 0.31 carat in weight, and comes with Very Good polish and Excellent symmetry, as verified from an independent gemological laboratory. The diamond is graded D in colour, and has a clarity grade of VVS1. The diamond's GIA grading report number is 3305425612, which will detail further its specifications and measurements, and will also come with the purchase of the stone. This Marquise diamond is 0.31 carat in weight, and comes with Very Good polish and Excellent symmetry, as verified from an independent gemological laboratory. The diamond is graded F in colour, and has a clarity grade of VS2. The diamond's GIA grading report number is 1297580861, which will detail further its specifications and measurements, and will also come with the purchase of the stone. AUD 3,144 Excl. Duties / Taxes. This Marquise diamond is 0.71 carat in weight, and comes with Very Good polish and Excellent symmetry, as verified from an independent gemological laboratory. The diamond is graded D in colour, and has a clarity grade of SI1. The diamond's GIA grading report number is 1196940251, which will detail further its specifications and measurements, and will also come with the purchase of the stone. AUD 2,555 Excl. Duties / Taxes. This Marquise diamond is 0.58 carat in weight, and comes with Excellent polish and Excellent symmetry, as verified from an independent gemological laboratory. The diamond is graded E in colour, and has a clarity grade of IF. The diamond's GIA grading report number is 6177974128, which will detail further its specifications and measurements, and will also come with the purchase of the stone. AUD 1,111 Excl. Duties / Taxes. This Marquise diamond is 0.3 carat in weight, and comes with Very Good polish and Excellent symmetry, as verified from an independent gemological laboratory. The diamond is graded F in colour, and has a clarity grade of VS2. The diamond's GIA grading report number is 2287794863, which will detail further its specifications and measurements, and will also come with the purchase of the stone. AUD 5,590 Excl. Duties / Taxes. This Marquise diamond is 0.9 carat in weight, and comes with Excellent polish and Excellent symmetry, as verified from an independent gemological laboratory. The diamond is graded F in colour, and has a clarity grade of VS1. The diamond's GIA grading report number is 5323224293, which will detail further its specifications and measurements, and will also come with the purchase of the stone. This Marquise diamond is 0.6 carat in weight, and comes with Very Good polish and Excellent symmetry, as verified from an independent gemological laboratory. The diamond is graded D in colour, and has a clarity grade of SI1. The diamond's GIA grading report number is 1303030469, which will detail further its specifications and measurements, and will also come with the purchase of the stone. AUD 5,044 Excl. Duties / Taxes. This Marquise diamond is 0.75 carat in weight, and comes with Excellent polish and Excellent symmetry, as verified from an independent gemological laboratory. The diamond is graded D in colour, and has a clarity grade of IF. The diamond's GIA grading report number is 2193647160, which will detail further its specifications and measurements, and will also come with the purchase of the stone. AUD 3,723 Excl. Duties / Taxes. This Marquise diamond is 0.82 carat in weight, and comes with Excellent polish and Excellent symmetry, as verified from an independent gemological laboratory. The diamond is graded G in colour, and has a clarity grade of SI1. The diamond's GIA grading report number is 2326458286, which will detail further its specifications and measurements, and will also come with the purchase of the stone. AUD 1,531 Excl. Duties / Taxes. This Marquise diamond is 0.51 carat in weight, and comes with Excellent polish and Excellent symmetry, as verified from an independent gemological laboratory. The diamond is graded F in colour, and has a clarity grade of SI2. The diamond's GIA grading report number is 2317145914, which will detail further its specifications and measurements, and will also come with the purchase of the stone. This Marquise diamond is 0.62 carat in weight, and comes with Excellent polish and Excellent symmetry, as verified from an independent gemological laboratory. The diamond is graded G in colour, and has a clarity grade of VVS1. The diamond's GIA grading report number is 6312842958, which will detail further its specifications and measurements, and will also come with the purchase of the stone. AUD 15,717 Excl. Duties / Taxes. This Marquise diamond is 1.5 carat in weight, and comes with Excellent polish and Excellent symmetry, as verified from an independent gemological laboratory. The diamond is graded G in colour, and has a clarity grade of VVS2. The diamond's GIA grading report number is 1159512551, which will detail further its specifications and measurements, and will also come with the purchase of the stone. This Marquise diamond is 0.63 carat in weight, and comes with Excellent polish and Excellent symmetry, as verified from an independent gemological laboratory. The diamond is graded H in colour, and has a clarity grade of VVS1. The diamond's GIA grading report number is 6271831998, which will detail further its specifications and measurements, and will also come with the purchase of the stone. This Marquise diamond is 3.03 carat in weight, and comes with Very Good polish and Excellent symmetry, as verified from an independent gemological laboratory. The diamond is graded J in colour, and has a clarity grade of SI2. The diamond's GIA grading report number is 7308349457, which will detail further its specifications and measurements, and will also come with the purchase of the stone. AUD 4,228 Excl. Duties / Taxes. This Marquise diamond is 0.75 carat in weight, and comes with Excellent polish and Excellent symmetry, as verified from an independent gemological laboratory. The diamond is graded G in colour, and has a clarity grade of VS1. The diamond's GIA grading report number is 5191826676, which will detail further its specifications and measurements, and will also come with the purchase of the stone. This Marquise diamond is 0.7 carat in weight, and comes with Excellent polish and Excellent symmetry, as verified from an independent gemological laboratory. The diamond is graded E in colour, and has a clarity grade of VS1. The diamond's GIA grading report number is 5306397658, which will detail further its specifications and measurements, and will also come with the purchase of the stone. AUD 4,067 Excl. Duties / Taxes. This Marquise diamond is 1 carat in weight, and comes with Excellent polish and Excellent symmetry, as verified from an independent gemological laboratory. The diamond is graded J in colour, and has a clarity grade of SI1. The diamond's GIA grading report number is 7323539883, which will detail further its specifications and measurements, and will also come with the purchase of the stone. AUD 5,821 Excl. Duties / Taxes. 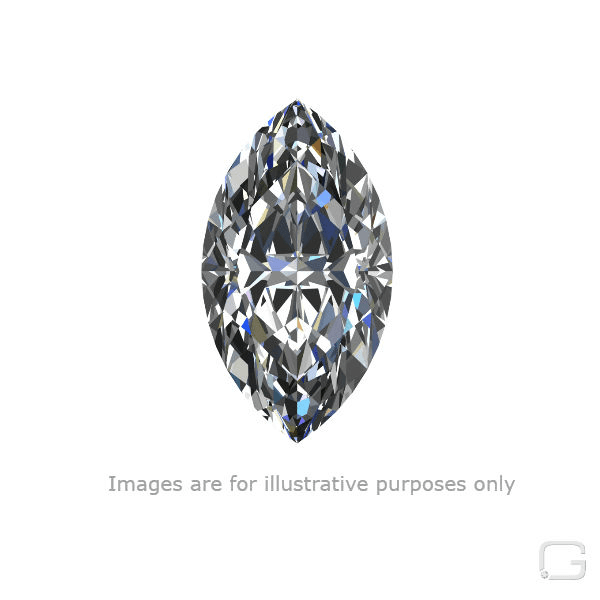 This Marquise diamond is 1.01 carat in weight, and comes with Excellent polish and Excellent symmetry, as verified from an independent gemological laboratory. The diamond is graded I in colour, and has a clarity grade of VVS2. The diamond's GIA grading report number is 1305961189, which will detail further its specifications and measurements, and will also come with the purchase of the stone. AUD 13,309 Excl. Duties / Taxes. This Marquise diamond is 1.29 carat in weight, and comes with Excellent polish and Excellent symmetry, as verified from an independent gemological laboratory. The diamond is graded E in colour, and has a clarity grade of VVS1. The diamond's GIA grading report number is 6325264778, which will detail further its specifications and measurements, and will also come with the purchase of the stone.